The much-loved star of the Harry Potter films and Die Hard had been suffering from cancer. 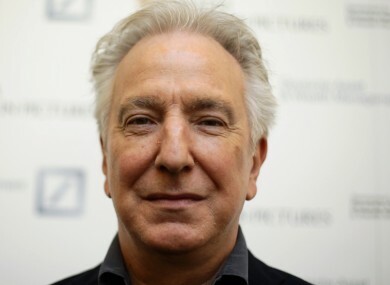 ACTOR ALAN RICKMAN has died aged 69, his agent has confirmed. A big screen presence for decades, Rickman was best known to global audiences for his roles as the villain Hans Gruber in Die Hard and as Professor Snape in the Harry Potter films. The actor and director Alan Rickman has died from cancer at the age of 69. He was surrounded by family and friends. Known for playing the ‘bad guy’ in Hollywood productions, he also portrayed the Sheriff of Nottingham in the Kevin Costner-starring Robin Hood: Prince of Thieves as well as Rasputin in a 1996 HBO movie. He starred alongside Emma Thompson and Hugh Grant in both Ang Lee’s adaptation of the Jane Austin novel Sense and Sensibility, and in the Richard Curtis romantic comedy Love Actually. One of Britain’s best-loved stars, Rickman’s stage breakthrough came in 1985 when he played Valmont in Christopher Hampton’s Les Liaisons Dangereuses, which later transferred to Broadway. He was also acclaimed for his title role in the Ibsen play John Gabriel Borkman, which ran at the Abbey in Dublin in 2010. That production also later moved to New York. Irish audiences will remember his turn as a languid Eamon DeValera in Neil Jordan’s 1996 biopic of Michael Collins. All the beauty we have lost this week. There was never justice. Goodbye Alan Rickman. We shall miss you. Actor Cathy Belton worked with Alan Rickman on the play John Gabriel Borkman at the Abbey Theatre in Dublin and while it toured in New York, and was also directed by him last year in the film A Little Chaos. “I was deeply saddened to hear the news of Alan’s passing today. It was a joy and a privilege to work with him but it was even more of a privilege to call him a dear friend,” she said. His talent was immense, his generosity of heart and time knew no bounds both professionally and personally. His dry Celtic wit was a joy to be around, always challenging, charming, questioning and listening. It was no wonder he felt so at home in Ireland during his many times working and visiting here. His death is such a great loss to us all, my heartfelt sympathies go to his beloved wife Rima, his rock and light at his side for over fifty years. The world is a lesser place without him and I will miss him greatly. Email “Actor Alan Rickman has died aged 69”. Feedback on “Actor Alan Rickman has died aged 69”.